Karaoke Cash Video Slot Review - Casino Answers! Karaoke Cash is a 5-reel, 20-line video slot developed by Vegas Technology, featuring a wild symbol, scatter wins, multipliers, a free spins feature and a bonus game. You can play the Karaoke Cash video slot at Bovada. Bets on the Karaoke Cash slot machine are $0.01, $0.05, $0.10, $0.25, $0.50, $1, $5 and $10 per line. You can select up to 20 paylines by using the “Bet One” button or the buttons on the sides of the reels. You can bet as little as a penny or as much as $200 per spin on the Karaoke Cash penny slot. Karaoke Cash has a very good betting range, suitable for casual players and high rollers. You can manually skill stop your spin on the Karaoke Cash online slot by pressing the “Stop Spin” button in the middle of any spin you make. To play Karaoke Cash, select your bet and press the “Spin” button. To play all 20 paylines, you can also use the “Bet Max” button to spin the reels. The Gold Record is the top paying symbol on the Karaoke Cash video slot. When you hit 5 Gold Record symbols on a selected payline in Karaoke Cash, you will win its 10,000 coin top jackpot. he Gold Record symbol is wild and will substitute for all symbols except for the bonus and scatter symbols. The second highest paying regular symbol is the Notes symbol, which can pay up to 1000 coins for 5 symbols. The Recording Contract is Karaoke Cash’s scatter symbol. You only need two Recording Contract symbols anywhere on the reels to generate a payout. If you land 5 Recording Contract symbols on the reels of Karaoke Cash, you will win 1000X your total bet – one of the best scatter wins around. 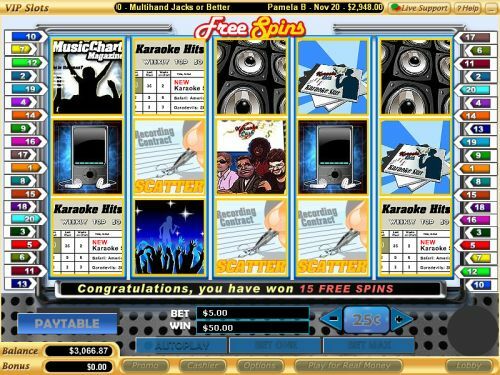 If you land 3 or more Scattered Recording Contracts anywhere on the reels, you will win 15 free spins at a 2X multiplier. All winnings are doubled during the free spins feature except for bonus winnings and additional free spins. Additional free spins can be won during the free spins feature. Win yourself some Karaoke Cash when you activate this free spins feature at Bovada! All payouts are based on the Paytable. Only the highest win per selected payline is awarded. All symbols pay left to right in consecutive order, except for the scatter symbol (which pays any). Scatter wins are multiplied by the total bet. Scatter wins are paid independent of the paylines selected. The Gold Record symbol is wild and will substitute for all symbols except for the Logo and Contract symbols. Hit “Autoplay” to open up the Karaoke Cash autoplay mode where you can select the number of spins (5, 10, 25, 50, 100, 250 or 500) and number of seconds between spins (0, 0.25, 0.50, 1, 1.50 and 2). Stop settings are stop once all spins are complete, stop when jackpot is won, stop if a win exceeds or equals ($50, $100, $150, $200 or $250), stop on any win and stop if credits increase/decrease by ($50, $100, $150, $200 or $250). You can cancel autoplay on the Karaoke Cash online slot at any time. 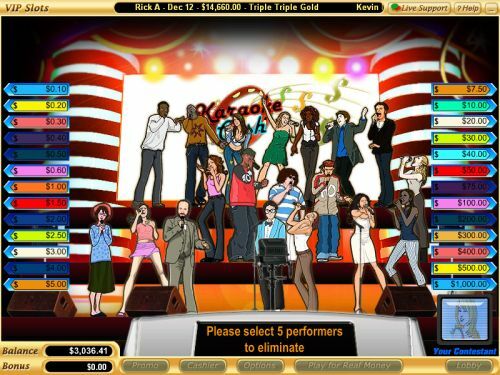 Fans of music, singing, American Idol and other talent shows will enjoy playing the Karaoke Cash video slot. It has an excellent top payout, the best top scatter prize we can recall, a free spins feature and a bonus game. Karaoke Cash also offers some very nice presentation. Overall, it would surely rank among the higher Vegas Tech video slots. You can play it when you sign up and make a deposit today at Bovada! How much can I win in the Karaoke Cash bonus round? Depending on your bet, you can win up to $100,000 in the Karaoke Cash bonus game. Remember to eliminate the contestant’s wisely! Can players who live in the United States play the Karaoke Cash bonus slot? American players are most welcome to play the Karaoke Cash slot game at Bovada. For more Vegas Tech casinos where you can find the Karaoke Cash slot machine, please read our list of Vegas Tech online casinos. Where can I find a free flash game of the Karaoke Cash online slot? Unfortunately, the Karaoke Cash flash game is not currently offered for Instant Play at Bovada. However, you can play several other Vegas Tech video slots at the Instant Play casino.